Just 21 miles from historic Charleston, Kiawah Island is nestled in semi-tropical wilderness, picturesque marshes with ten miles of wide, unspoiled, golden beaches. This lovely cottage is conveniently located in West Beach Village with only a short walk to the ocean, pool, Cougar Point Golf Course, tennis courts, restaurants, shops and many other activities. Our guest book in the living room is filled with enthusiastic accolades from our valued guests, many of whom return each year. We invite you to make our Kiawah home your vacation home as well. My father, Joe Kay, although born in Lakeland, FL, grew up in South Carolina. After highschool in Moncks Corner, he graduated from the Citadel in 1953. My husband and I were introduced to Kiawah in 1979 and encouraged Daddy to come check out the beautiful island only 21 miles from Charleston. He purchased The Treehouse in 1986 and has shared it with renters every since! Recently updated and refreshed, the Treehouse is your home away from home. Many guests tell us how much they enjoy all the amenities we provide so few extra things are brought from home. We love dogs and want you to bring your babies with you to enjoy. Dogs can run free on the beaches from October - March. Other months, you can still enjoy the beaches with your dogs on leash. Please bring your preferred coffee. Filters provided. Wrap around deck with door at the top of the stairs to keep your 4 legged family from straying. Make time to enjoy a nap in the hammock! Enjoy Championship courts. Voted #1 tennis destination in 2015. Enjoy play on 5 public courses on the island and 1 just prior to turning onto Kiawah. Available only for Sparrow Pond guests. Just a quick 2 minute walk from the cottage! 2 queens, 2 twins. Community pool (free to guests), hammock, screened porch, wrap-around deck, covered parking, deck furniture includes hammock & rockers, beach chairs, outside swing, outside shower. Loved the rental house. Owners were so thoughtful to stock with necessities and the whole experience was a notch above typical rental property. Very clean and thought out. Construction next door is an issue be couldn’t be avoided. Beach was incredible and close. Great location and perfect for the whole family. Sandy was great. The Treehouse was really accommodating for our Christmas vacation and we were able to bring the whole family, (dogs included). The place is convenient to both Charleston and the beach. 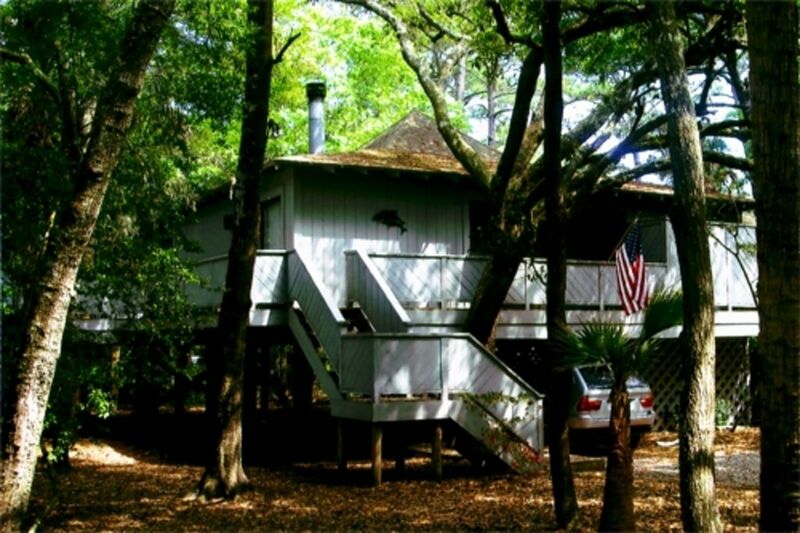 Easy drive to Charleston and short walk to the beach down the beach path. The house is just so perfect for dogs and for a relaxing getaway for the whole family. We sat on the screened in porch and played cards every evening and relaxed in the hammock to read a book. The wrap around deck is great for the dogs and the carport underneath just makes loading and travel so simple. My dogs and my people had the best time. We hope to make it a family tradition. Good location and easy access to the beach and bike paths. The condo was well equipped with everything anyone would need. Clean and comfortable. The house was wonderful, clean and very cozy. The close proximity to the beach and pool was great. We had a wonderful vacation on Kiawah. The accommodations were wonderful. The house was very clean and cozy. The location was perfect with its close proximity to the beach and pool. The owner was wonderful, very concerned that all our needs were met. We are already planning a second trip to Kiawah and wouldn’t think of staying anywhere else. Great place! Plenty of space for our family. Close walk to the beach. Beach chairs and cart provided, an added bonus! Rented this thinking we would take our yorkies but decided against it last minute. House was set up nicely for pets and even had a crate. House is a little dated but clean and serviceable. There is only one television in the unit in case that's important to your group. Cleaning crew was very accomodating. Beach is very close as is the pool. Multiple extras available at the rental including a beach cart, several chairs, beach towels, boogie board, etc. Owner is responsive to questions. The community is very quiet. Only reason I didn't give it higher marks was proximity to current construction (no one's fault ... just a little inconvenient). Please come back next year to see the renovation already scheduled! We are taking the carpet out of the bedrooms and refinishing the hardwood floors in August and renovating the kitchen in November! Hope to SEA you back soon. I'm SHORE you will like the renovations!! Kiawah offers an abundance of activities for the entire family. There is golf (we are almost across the street from the Cougar Point Golf Clubhouse); tennis (just a few blocks away); beach (2-3 minutes walk); pool (you will pass it on the way to the beach and it's free for guests); walking/ biking (over 10 miles of paved nature trails); shelling (even starfish and sand dollars can be found); fishing; sailing; boating (boat rentals at Bohicket Marina); shopping; dining (several excellent restaurants nearby); trips to historic Charleston (just 21 miles away); and many, many others. Holiday and Special event week rates may be higher.